Table S1 in MS Excel format. This is the data file for the R code "Yasuharaetal_JB_code.R". This is the entire dataset, and other datasets here are a subset of this dataset. R code used for the general additive models (GAMs), "Yasuharaetal_JB_code.R". Eocene-Oligocene dataset used for the R code "Indo-Pac_figs.R". Pliocene-Pleistocene dataset used for the R code "Indo-Pac_figs.R". Modern Indo-Australian Archipelago (IAA) dataset used for the R code "Indo-Pac_figs.R". Late Miocene dataset used for the R code "Indo-Pac_figs.R". Northeastern Japan (NEJP) dataset used for the R code "Indo-Pac_figs.R". Southwestern Japan (SWJP) dataset used for the R code "Indo-Pac_figs.R". Indo-Australian Archipelago (IAA) dataset used for the R code "Indo-Pac_figs.R". Early Miocene dataset used for the R code "Indo-Pac_figs.R". Middle Miocene dataset used for the R code "Indo-Pac_figs.R". Modern dataset used for the R code "Indo-Pac_figs.R". The R code used for supplementary figures, "Indo-Pac_figs.R". Aim: Cenozoic dynamics of large-scale species diversity patterns remain poorly understood, especially for the Western Pacific, in part, because of the paucity of well-dated fossil records from the tropics. This article aims to reveal the spatiotemporal dynamics of species diversity in the Western Pacific through the Cenozoic, focusing on the tropical Indo-Australian Archipelago (IAA) biodiversity hotspot. Location: Tropical and north-western Pacific Ocean. Methods: We analysed well-preserved fossil ostracodes from the tropical Western Pacific and combined their diversity data with other published data from the region to reconstruct Cenozoic dynamics of species diversity in the tropical and north-western Pacific Ocean. We fitted generalized additive models to test for differences in richness over time and across geographical regions while accounting for sample-size variation among samples. Results: Low-, mid- and high-latitude regions all show a similar diversity trajectory: diversity is low in the Eocene and Oligocene, increases from the Early Miocene to the Plio-Pleistocene but then declines to the present day. Present-day high biodiversity in these regions was established during the Pliocene with a remarkable diversity increase at that time. Latitudinal diversity patterns are relatively flat and never show a simple decline from the tropics to higher latitudes. Main conclusions: Western Pacific Cenozoic ostracodes exhibit a spatiotemporal pattern of species diversity that is inconsistent with the commonly reported and persistent pattern of declining diversity from the tropics to the extratropics. While this inconsistency could be interpreted as evidence that ostracodes are a contrarian clade, Atlantic ostracodes display a standard latitudinal species diversity gradient. Contrasting patterns between oceans suggest an important role for regional factors (e.g. 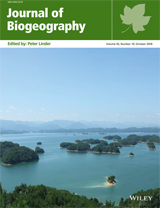 plate tectonics and temporal geomorphological dynamics) in shaping the biodiversity of the Western Pacific.